The OUT TO SEA museum exhibit on ocean plastics — crowdfunded and managed by AtKisson Group and hosted by Stockholm’s Tekniska museum March-June 2017 — was a milestone event that helped raise awareness locally and globally. Now, you can experience the whole story of this exhibit, including the behind-the-scenes account of how we got it funded (thanks to help from people like you! ), installed, promoted, and experienced live by over 30,000 people, 8,000 school kids, and many thousands of other people via TV and social media. Download our new, free e-book (just 24-pages), share it, and get re-inspired to take action on one of most pressing global issues of our time — an issue that only burst into global awareness in the last few years. OUT TO SEA was created by the Museum für Gestaltung Zurich and is also called the Plastic Garbage Project. It is a remarkable experience to stand face-to-face with tons of waste, gathered directly from the world’s seas and assembled in a museum. Display cases fashioned from moving pallets and other simple materials explain the scale of the problem, together with graphic images, maps, videos, and exploration cases that allow you to search for microplastics in the sand. Working with our partners Stina Axelsson and Gunilla Hedén in Stockholm, AtKisson Group was proud to be one of the initiators of our local exhibit, the manager of a successful global crowdfunding effort, the overall project administrator, and a major financial sponsor. We believe the time to act on ocean plastic is now. 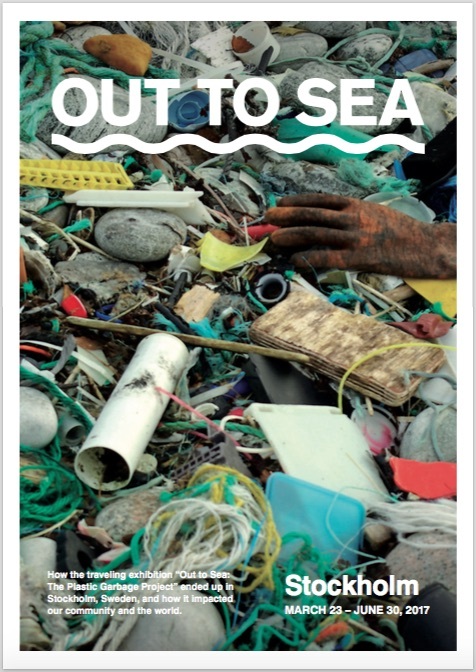 We invite you to re-experience OUT TO SEA, with this new e-book, and we encourage you to support efforts to clean “the scourge of plastic” (as David Attenborough calls it) from our seas.